23 years after Love Letter, Shunji Iwai makes his Chinese-language debut, produced by Peter Chan, with Last Letter, a variation on the same themes of ill-fated romance, missed opportunities and epistolary bonding and healing – and he’s actually already at work on a Japanese remake. Zhihua (Zhou Xun) just lost her sister Zhinan, and is taking care of her niece Mumu (Deng Enxi) and nephew Chenchen. 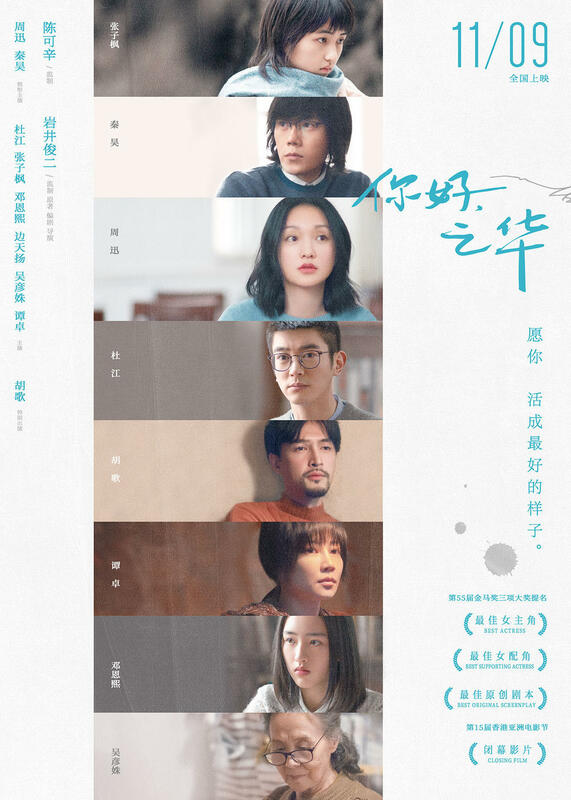 When she attends a high school reunion instead of her sister, to announce her death to her former classmates, she doesn’t find the right moment to do so, and is at a loss when Yin Chuan (Qin Hao) reconnects with her: she used to be in love with him, but he was in love with Zhinan, and now he is mistaking her for her sister. Yet rather than clarifying the situation, she starts sending him letters, thus reviving countless memories of the past, while her own daughter Saran (Zhang Zifeng) and Mumu get in on the correspondence, by a twist of fate. Soon there are revelations, some arriving too late.